Well, it’s been a long time coming, but today I finally DESTROYED my garage! And no, not with a Solar Death Ray, nor dropping a bowling ball on it! My whole secret master plan (If Elon Musk can have a master plan, so can I) is to rebuild my garage, but FAR better than it is now. Improvements will include a slightly larger footprint, an upstairs, insulation, a heated floor, a second electric car charging station, and 5,000 watts of solar power. Today, my brother, Wayne, stopped over for the big push of demolishing the garage. First thing was to decide HOW we would tear it down. Without the garage doors, the whole garage was already somewhat wobbly. It seemed better to bring the garage completely down to the ground, rather than working up on the roof. Come to think of it, I only used a ladder at all to hold my video camera! We braced the structure from the outside by lag-bolting some long 2x4s to the frame and then to each other to make some giant triangles. That kept the garage from going anywhere while we removed all the cross-bracing – which was really only the siding on the back of the garage. After that, we removed the “downhill” brace. As Archimedes said, “Give me a place to stand (with a lever) and I can move the world.” We both grabbed our levers and lifted. 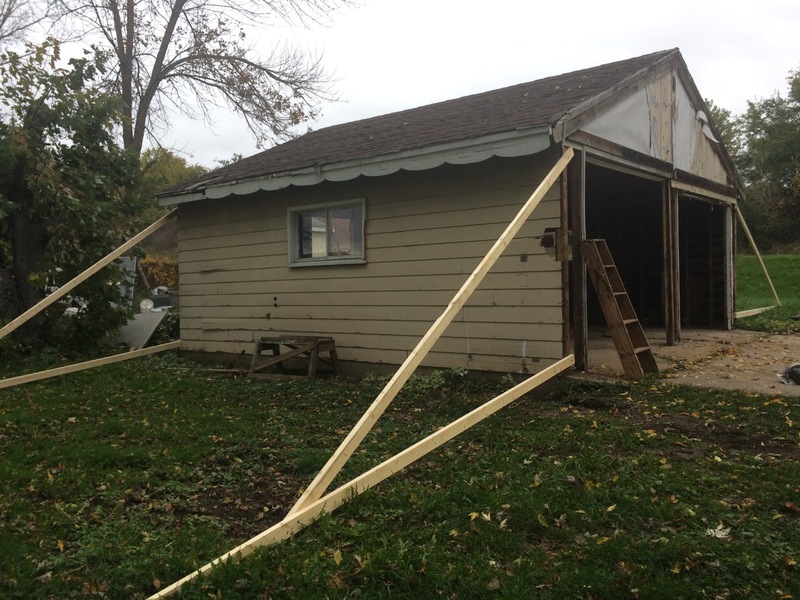 Thankfully, the trick worked exactly as planning, turning the garage into a parallelogram flat on the ground. After that, it was just A LOT of work, cutting off pieces and making them fit like Tetris into the dumpster. Once we cleaned up, there was plenty of space to park an electric car. Unfortunately, no place to charge it. Not to fear, I already rewired the old garage breaker box on my back porch, and the EVSE cable can reach the driveway. There’s still lots of work to be done. Next will be removing the old concrete. Then, plenty of digging, new concrete, and building the actual garage, followed by installing solar panels. It will be hard work, but exciting too. Til Next Time, Stay Charged-Up! I know I am!